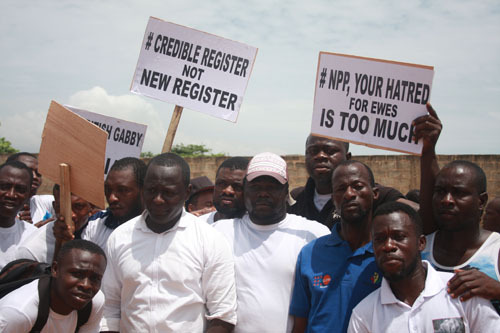 Members of Coalition for the Defence of Equal Citizenship (CODEC), a pro-National Democratic Congress (NDC) group, yesterday embarked on a demonstration through some streets of Accra to condemn calls by the New Patriotic Party (NPP) and other groups and individuals for a new voter register. According to CODEC, the NPP had been circulating certain “untruths” about the need for a new voter register because it has some hidden agenda for the 2016 general elections. The demonstration, which was engulfed by heavy security presence, started with a public march from the Obra Spot, Kwame Nkrumah Circle, through Adabraka and ended at the Arts Centre. Speaking during the protest march, Ali Dawud, director of operations, CODEC, said the current biometric register is clean, has no loopholes or any problems in it. “This demonstration is a proof to the whole of Ghana that we at CODEC do not agree with the NPP on the noise calling for a new voter register. …. The current biometric register does not allow double registration. With all the advantages the present register has, why would someone say because they lose out after every election, Ghana should change the voter register?” Ali Dawud quizzed. It will be recalled that the NPP petitioned the Electoral Commission over the current electoral roll and provided evidence of names of about 80,000 Togolese nationals on the register. But Ali Dawud stated that the evidence presented by the NPP was false and had no valid evidence to support its claims. “We as a group have looked into the matter and there is no evidence to back that claim. The NPP is just making noise about the issue. They should stop spreading the falsehood. We at CODEC are supporting the independence of the EC. They should keep up with their good work and they should not be intimidated by anyone or be threatened by the cacophonous noise the NPP or any other group is making,” he said. “We don’t want a new register; we want peace,” one of the demonstrators said. Ali Dawud added that the group supports the calls for the EC to audit the existing register. “CODEC supports that viewpoint that the voter register should be audited. If there are mistakes with the current register, we have the right to audit it. We have internal mechanisms to audit the voter register. Why throw it away and get a new one? You do not throw away the bath water together with the baby; you only audit where necessary but you do not throw it away and call for a new one,” he posited.